(Closer to) Zero Waste - Five things you can do right now to cut your expenses, increase your self-sufficiency, and make the world a better place for all of us. Instead of just throwing stuff in the trash, what do we do? One of the big projects I took on while Joe was away for a month was a bathroom makeover. The girls' Daddy, my beloved husband is home. One of the things I couldn't tell you is that Daddy was away for a month. One of the primary tenets of OpSec (Operations Security) is to not broadcast/publish/post/announce/etc travel dates, plans, absences etc. As a somewhat somewhat small female with two little ones in tow, we don't announce to the world that we're on our own for a month. A month is a long time. I even read my own article on solo parenting in a few times of desperation. Waitaminit. I know how to do this. I wrote about it. Didn't think I was writing it to help future-me, but hey. Oh right! That's what we do. While it wasn't a deployment and his stateside training made regular contact possible, he was gone long enough that we had to form new patterns, routines, and lots of extra snuggling wherever they could get it. With extra treats, lots of toddler meals, and so much love and support from friends and family, we are back together. And little worse for the wear. Now if we could just get through this heat we will get back to making this space home! I'm looking forward to showing you all the marvelous things we created, built, planted, spread, stenciled, painted, and spruced while Daddy was gone. 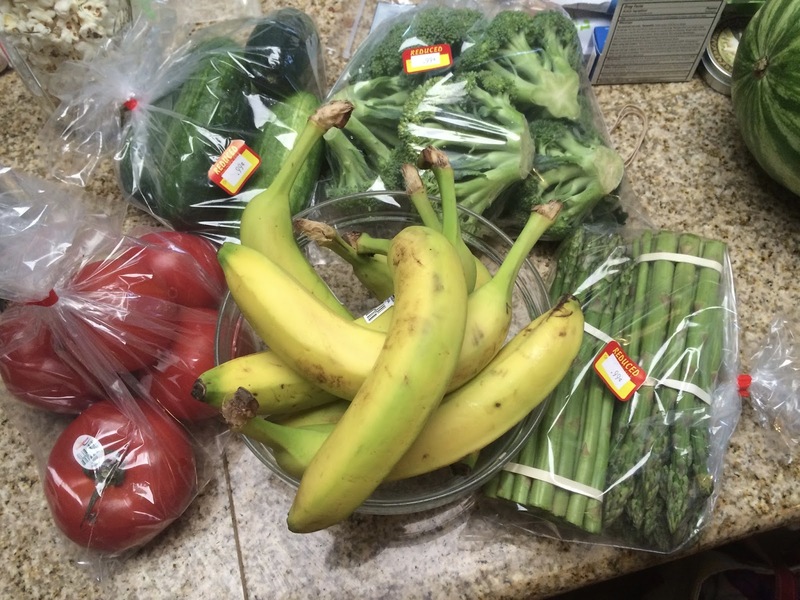 The best $5 I've ever spent - buying not so perfect produce. Recently I've been seeing lots of articles about "ugly" vegetables - ones that don't meet the perfection standards held by many grocery stores. They aren't any less nutritious, they aren't even necessarily damaged in any way. For anyone looking to eat well for less, try looking in the "day old" bin or reduced price cart at your local grocery store. There's a local market that's a little farther from our house (but closer to Joe's work) that has a wonderful discount shelf. Often it's just "ripe bananas" 3lbs for 99c but occasionally there are lots of other goodies. They may have a soft spot. They may be the last of the batch, or they may just need to be peeled. Bananas for snacks and the freezer. Our favorite local bakery almost always has goodies in a day old bin. The only difference in taste and texture is the same as you get from buying food and not eating it all the day you buy it. If I buy a couple of scones I'm not going to finish them completely within a couple hours. I'd much rather get a couple goodies at half the price and enjoy them just as much. We've been very busy, but I can't tell you about it. A certain someone hasn't seen our work yet. But I can't tell you about that either. Not yet at least. Before learning that my husband would be gone for more than a month over the course of this summer, we signed up for a CSA farmshare. Most CSAs have "small" or half shares which would be plenty for our family of two adults and two quite littles. We decided to go with a full sized share to challenge ourselves to eat more vegetables and to put more food by for the winter. While I haven't found a way to preserve lettuce other than use it as social capital and spread the wealth, I've been busy chopping, freezing, canning, and prepping. 1gal bag of frozen mixed greens - beet tops, kohlrabi greens, chard, etc. We have beets collecting for pickled beets and have been pretty well keeping up with everything else. "We eat local all year 'round because we can." What are you preserving, canning, freezing, drying, fermenting, putting up or putting by?